“In the days to come… As i kick off the celebration of 30 years on stage as a comedian, I will be revealing how 30 Nigerians below the age of 30 will benefit from my N30m intervention revolving loan. You need to begin to structure your business now before September 30. What kind of business are you into? Can your business give me back my N1m if I give it to you without interest in 1 year?” he wrote. Born Atunyota Alleluya Akpobome but famously recognized by his code name Ali Baba, is a Nigerian stand-up comedian and actor. He is one of the most sought after Nigerian stand-up comedian and the unofficial founding father of Stand-up comedy in Nigeria. 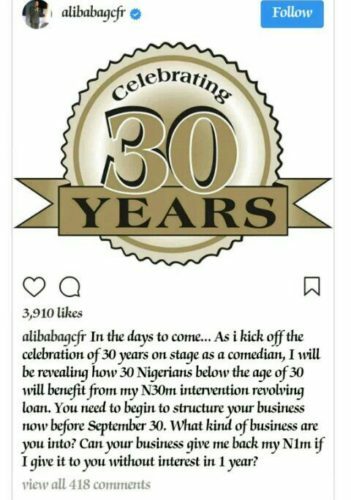 Ali Baba started comedy back in the days when there were only few people in the business and it wasn’t paying off that much. He become one of the best and mentor to many big names in the comedy business. 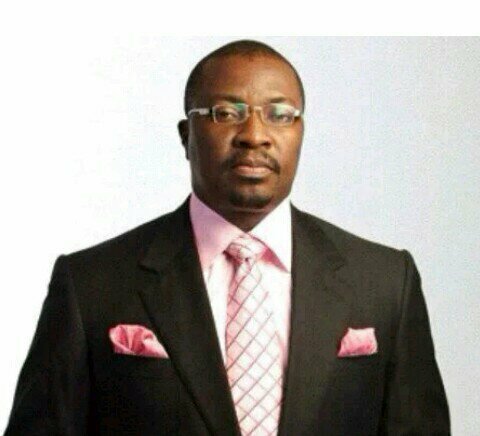 Atunyota Alleluya Akporobomerere whose stage name is Ali Baba was born into a Royal Family in Agbarha Otor, Ughelli North Local Government Area of Delta state. Ali Baba is the first son after several girls. The ace comedian spent the first 8 years of his life in Warri (Delta State, Nigeria). His biological father was a gallant soldier who served in Lagos but now retired. He completed his primary and secondary school education at Ojo Primary School and Command Secondary School both in Lagos. After his basic education, he furthered at Ibru College in Agbarha-Otor and then went on to study at Bendel State University now known as the Ambrose Alli University, Ekpoma AAU where he bagged a degree in Religious Studies And Philosophy. After obtaining a degree from the then Bendel State University, Ekpoma AAU in 1990, he moved down to Lagos to pursue a career in comedy properly. He discovered his comic talent in his third year in University and planned to return to Ekpoma to read Law but that path was not made to happen in his life because he discovered that he could make clean cash by just making people laugh and forget their worries. His professional comedy career kicked off at after appearing on corporate events, television shows along side Patrick Doyle, Charly Boy and Danladi Bako. He also made appearances on radio shows with Bisi Olatilo, Sani Irabor and Mani Onumonmu. He also had a stint with Dapo Adelegan of DP Lekki Limited as executive assistant in 1991. His determination was so persistent as he was passionate about enhancing himself, improve his skill and becoming the first professional comedian from this part of the world. In those days when he launched his comedy career only few people were funny and they were not into Stand-up comedy. They only funny people we have in those days were the likes of Patrick Doyle, John Chukwu, Bisi Olatilo, Femi Segun, Femi Jarret, Leo Onwudi, Smart Otemu, Tony St. Iyke and a few more of them but they were not into full-time comedy because they weren’t aware of the benefit that comes with it. After working very hard for a long time to create a brand and a niche for himself, at last he was able to carved out a niche for himself as a comedian for both corporate and non-corporate events. He became so professional that he could make rules , broke them and sometimes even discarded them depending on how effective they were. Four years into his career , he became the most sought after in the business and tagged Master of Ceremony. You would easily agree with me that no event is considered complete without a Comedian to MC the event these days . He gradually and progressively grew bigger and better each day that passes by, he registered his company Alibaba Hicuppuray 3rd in 1993 and he made sure that comedy becomes a professional career . In 1998, he hired billboards in strategic parts of Lagos Ozumba Mbadiwe Street, Victoria Island; Osborne Road, Ikoyi and the Marina paying for two years. The message was simple and one he has come to be known by Being Funny is Serious Business. 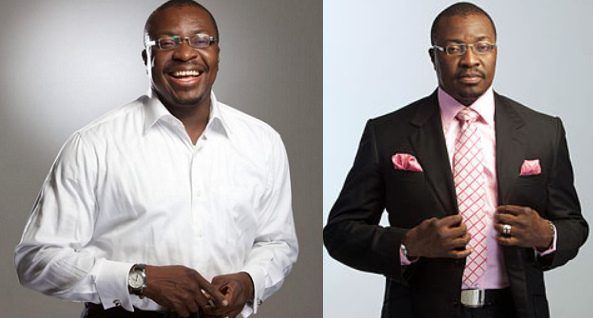 Ali Baba as the top and most respected Nigerian comedy merchant is of the opinion that the comedy business he founded is a big industry that is wide open for all who want to make their chosen profession. He has supported, mentored and presented several comedians helping to ensure that standards are maintained and professionalism encouraged. Comedy is one of the most lucrative segment of entertainment today and comedians are generally known to charge impressive fees for events. The Comedy Industry is growing fast and strong to the credit of the God Father of Comedy , almighty king of comedy named Ali Baba. He has spent over twenty years in comedy business and still counting because he is not considering retirement any time soon.